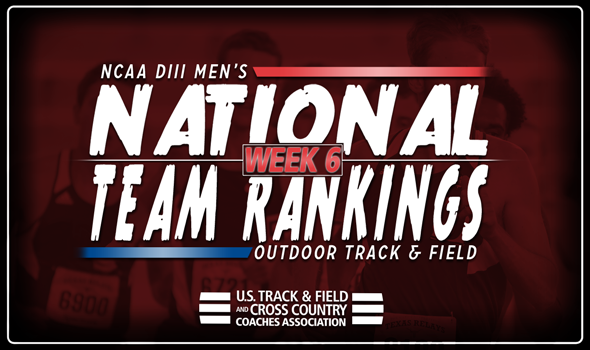 NEW ORLEANS – Conference Championship Weekend changed the complexion of the NCAA Division III Men’s Outdoor Track & Field National Team Rankings. Only three teams in the top-25 remained in place when the newest rankings were released Tuesday by the U.S. Track & Field and Cross Country Coaches Association (USTFCCCA): No. 1 North Central (Ill.), No. 6 St. John Fisher and No. 24 Bethel (Minn.). The most notable change between Week 5 and Week 6 was the positioning of UW-La Crosse. The Eagles soared from No. 11 to No. 2 this week after another dominant performance at the WIAC Championships. Ernest Winters buoyed UW-La Crosse as he notched the top time in the nation in the 100 (10.42), clocked the third fastest mark in the 200 (21.14) and took the baton second on the top-ranked 4×100 relay team (40.63). Rowan and UW-Whitewater dropped to third and fourth, respectively. Augustana (Ill.) worked its way back inside the top-5 this week. The Vikings sit fifth – a two-spot improvement from Week 5 – following a strong weekend. Josh Yamamoto notched the second fastest time of the season in the 400 hurdles (51.84) and led off the now third-ranked 4×400 relay (3:13.57). UW-Stout comes in ranked No. 8, up four spots from last week. The Blue Devils were led by Sam Elsner at the WIAC Championships as he hit the second best mark of the season in the hammer (61.43m/201-6), which pairs well with his second-ranked discus effort and fourth-ranked shot put heave earlier this season. For the biggest jump of the week, look no further than Delaware Valley. The Aggies climbed 24 spots between Week 5 and Week 6 thanks to Ta’riq Thomas. The senior hit the top mark of the season in the long jump and the third best mark in the triple jump. Not only was his long jump of 7.86m (25-9½) the farthest in the nation, it also made Thomas the third best long jumper in the NCAA Division III history.